I had a wonderful time in England, traveling through London, Liverpool and York and on the Trafalgar coach on the way from York to Edinburgh--where I spent the remaining three nights of my trip—we made a sobering stop ten miles south of Manchester. Quarry Bank Mill (at Styal, Wilmslow) is owned by The National Trust and is kept as original to the period of 1784 to 1830 as possible. Thousands of orphans and unwanted children lived and worked at mill in exchange for room and board. The guided tour of the Apprentice House to see the close conditions in which the children lived—as well the working machines in the mill that wove cotton fabric and were so loud that most workers went deaf within six months—was heartbreaking. The mill and grounds look beautiful, but knowing what went on inside their walls made all visitors happy for how we live today and how indentured servitude was outlawed shortly after slaves in the US were freed by Lincoln. We had a lovely traditional English lunch in one of the event buildings at the mill, but it was hard to let go of what we just saw. Just three of the mill’s machines turned on was too much for any of us to take for more than a couple of minutes. We also hit the gorgeous Alnick Wick Castle in Alnwick, Northumberland, which is a classic medieval style castle stretching back 700 years. It is the residence of The Duke And Duchess Of Northumberland and is often visited by The Queen herself not to mention dignitaries from all over the world including President Obama. The stunning antiques and paintings (which include commissioned portraits of the Dukes and Ducchesses of Northumberland of the past) are too much to see in one day. The Gardens—including special roses gardens and even one called The Poison Garden with real poisonous plants—are breathtaking. 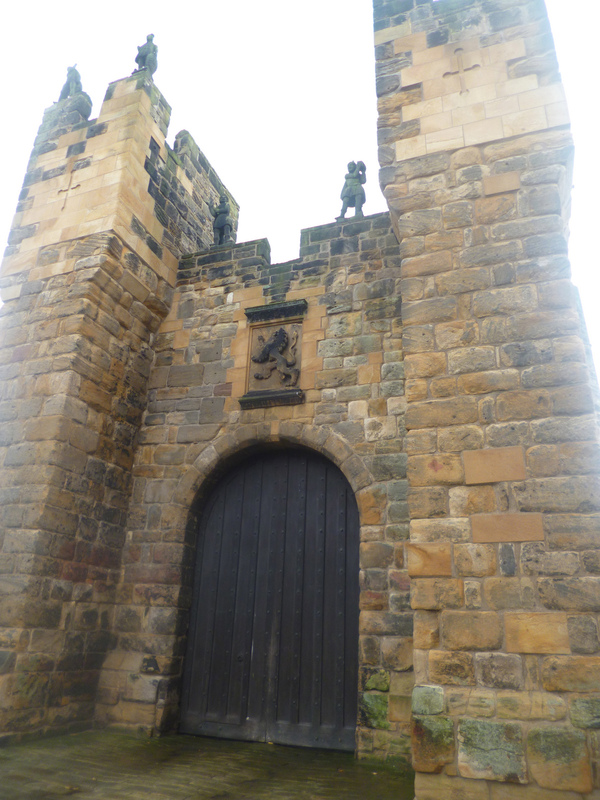 Alnwick Castle recently got even more popular as a sightseeing destination when the first two Harry Potter movies were shot there. Late in the say, the Trafalgar coach pulled into the ultra-modern Apex City Hotel in Edinburgh’s desirable Grassmarket neighborhood (at 61 Grassmarket, Old Town) about 2 ½ hours later and our guide gave us three hours to shop and see the sites. There are plenty of lovely candy and cashmere shops (fudge seems to be especially popular here) and the Beehive Inn (at 18-20 Grassmarket) directly across the street seems to be where everyone from the hotel heads over for a pint and traditional Scottish grub. We ate dinner at the picturesque The Witchery in Old Town the first night we were there and it offers a great three-course deal for about 33 pounds. This luxury eatery near Edinburgh Castle (at Castlehill on the Royal Mile) is also featured in the several ghost tours of Scotland available. 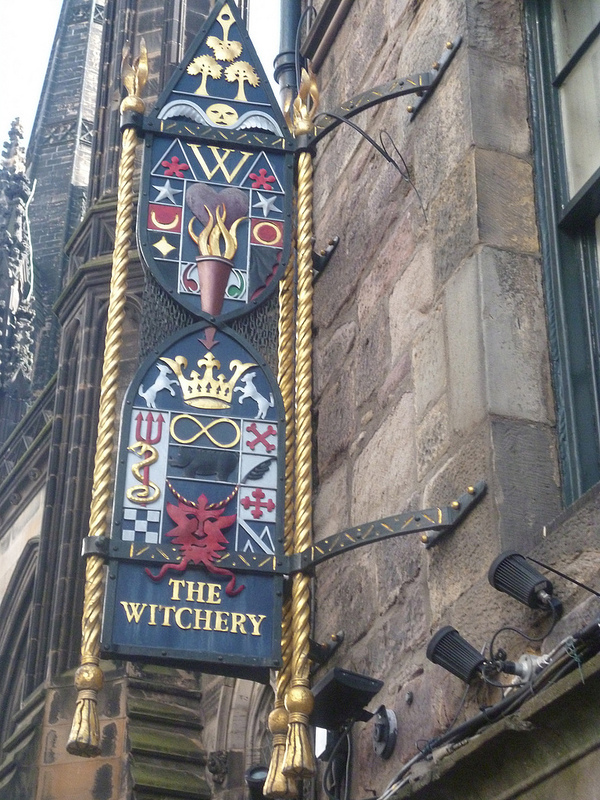 The Witchery features traditional Scottish grub including haggis, which my fellow travelers were trying to get me to try and I refused since I hear it includes all and any parts of a pig! The next morning it was time to visit Edinburgh Castle (in Castle Hill) itself. It’s a winding high walk on cobblestones to get all the way to the top, so be sure to wear comfortable shoes if you take it. We had a wonderful kilt-wearing guide who had interesting commentary about Mary Queen Of Scots and other royals who once lived in the majestic castle. My favorite part of the tour was not only the breathtaking views of Edinburgh from the top, but also the first floor of the Royal Palace building that houses the Scottish Royal Jewels. They are worth seeing if you are a gem or royals freak—and yes, there’s even restored red velvet and 18K gem encrusted gold crown. 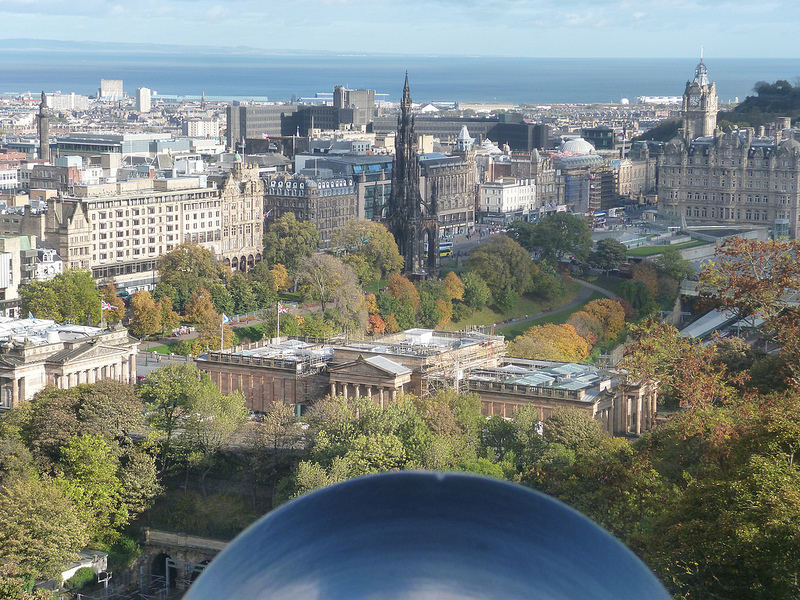 The One O’Clock Gun (which is really a cannon) goes off every hour on the hour; so don’t worry if you hear a sound that sounds like a bomb going off! The next day was spent getting up at seven am and having one of the wonderful breakfasts at the Apex Hotel and also using the complimentary computer they have on each floor of the hotel—and then moving on to a wonderful tour of the Glengoyne Scotch Whiskey Distillery, just 14 miles north of Glasgow in Dumgoyne (for further information, you can check out glengoyne.com). 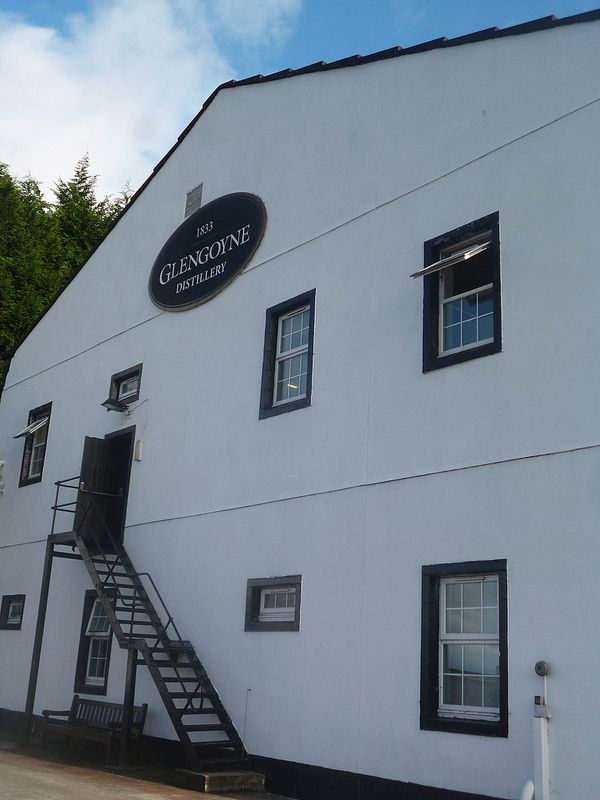 After a “wee” whiskey tasting and tour of the facility—which includes peeping inside barrels of whiskey before it goes off to be aged—guests can get insider prices on bottles of Glengoyne wonderful single malt scotch whiskey (from 10 years old on up) at their fascinating gift shop and also walk around the stunning land after the distillery. 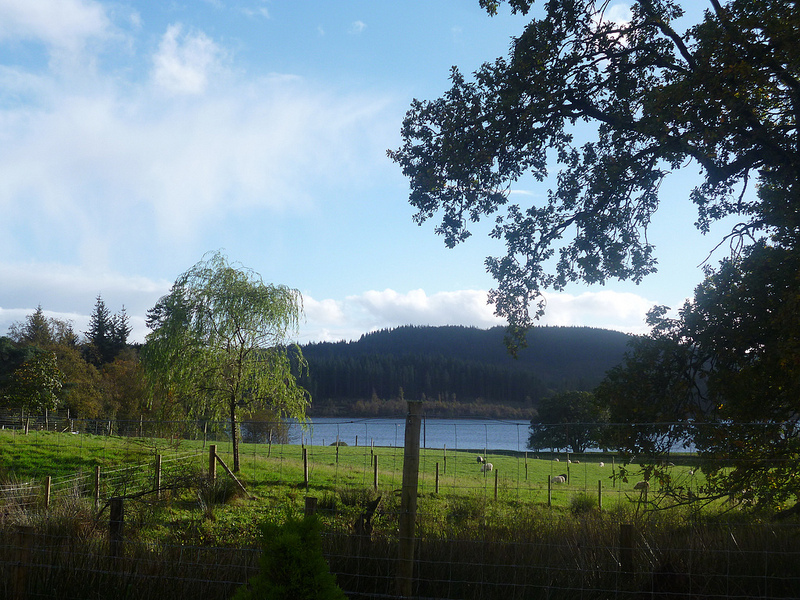 My tour group also did a wonderful Trafalgar “Be My Guest” visit to a working 600-year-old sheep farm called Ledard Farm (in Kinlochard, Stirling) that just happens to be owned by a family of professional musicians headed by Fergus Wood. They entertained us with Scottish music and storytelling while we ate gourmet Scottish grub including seafood caught on nearby shores the day before. This type of real-home experience makes Trafalgar unique, as we had to sing along with the family in order to be the winning team (who received a bottle of locally Scotch whiskey as a prize). It was a wonderful lesson in Scottish heritage, and lunch was ended with an up-close-and-personal meet and great with the “sheep dogs” that live and work on the farm. 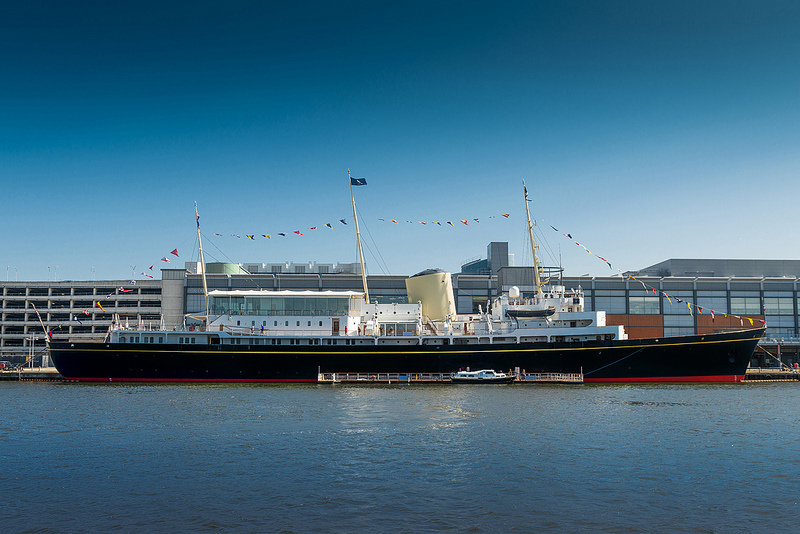 That night, we had a farewell dinner on board the magnificent 60-year-old Royal Yacht Britannia (docked at the Ocean Terminal in Edinburgh), site of four royal couple honeymoons including Charles and Diana. It was taken out of service in 1997 and all original chambers, including the Queen’s are now behind glasses so that tourists can get an inside look. The service at our private dinner was the most formal I have ever seen, as members of the wait staff had to place all dishes in front of dinners in swift synchronized move that was kind of a slow, smooth drop! My last day in Scotland saw me getting up at super-early for a 7:30 flight back to the US with a stopover in London, so I could not really take in any more of the wonderful Edinburgh shopping or sightseeing. It was nice how Trafalgar pre-arranged my wakeup call and my van pickup to go to the airport without me saying a word. I plan to go back again someday—and I might even try the haggis next time if I have enough drinks in me. LOL! For more information on combo England and Scotland tours lasting one week or longer, go to www.trafalgar.com.